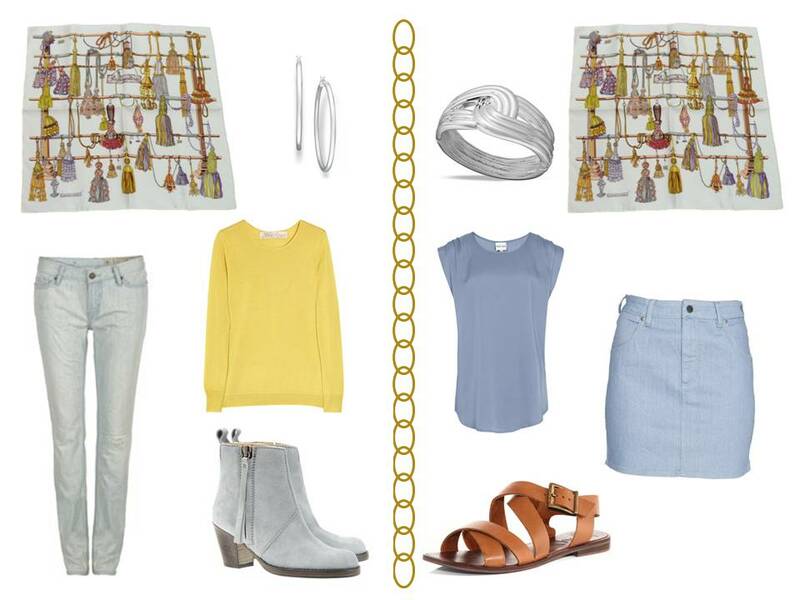 We’ve been chatting a lot about camel and grey together, and this scarf was the perfect opportunity to introduce a couple of outfits with those colors. Toss in a bit of soft blue, a little bit of yellow, and a dash of coral… What a great scarf upon which to build some looks! This is exactly the palate of my wardrobe, plus some black, white, and cream. I love these- soft and warm with a touch of coolness in the grey. 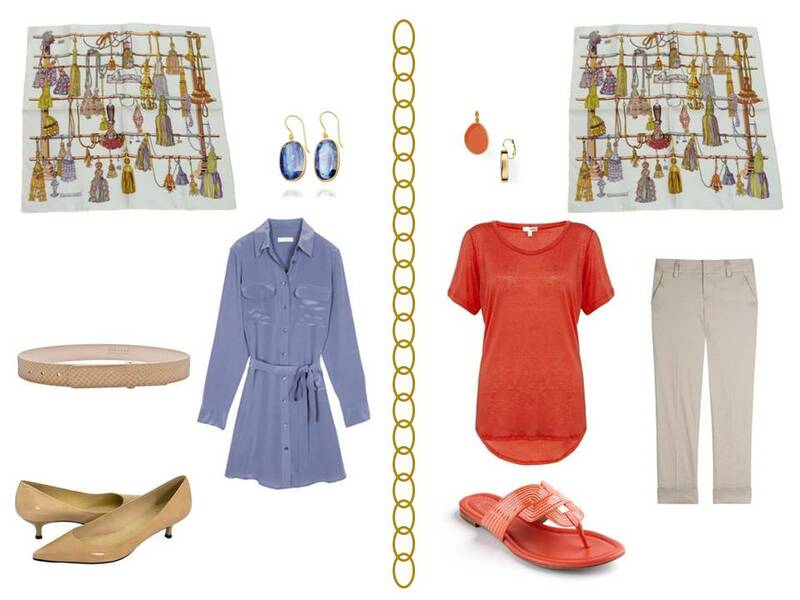 A beautiful transitional wardrobe for spring or fall. I will be stealing these ideas and combing my closet for similar combinations. Just what I was hoping for to take to Boston this spring and Ireland in the fall. Thank you! I think I may have to come visit you and have you take me shopping! Pretty! I don't usually wear camel because I don't think it suits my coloring, but I can see wearing that fifth (sheath and belted cardi) outfit right this very minute. Perfectly lovely! I agree with Kristien62 that your posts grow more and more interesting, while still unswervingly staying true to the Timeless, Elegant, Classic…mantra. Brava! I canot help but think this is for a blonde or grey-haired woman. So soft, yet with presence. That Equipment piece is a …dress???? You are very perceptive. 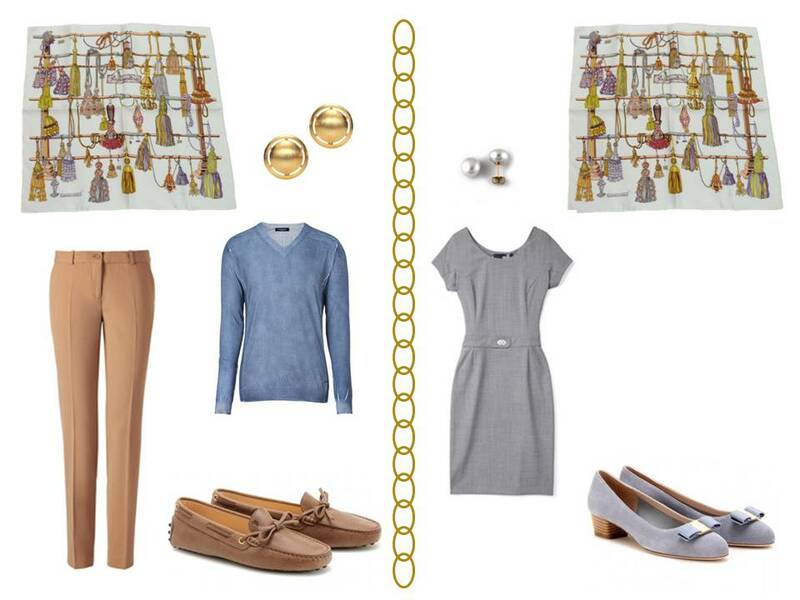 Although the scarf is Vivienne's inspiration, I suggested a camel and grey motif to help me build a travel wardrobe. I am "woman of a certain age" and ash-blonde. The combination is kinder to me than black or navy. This is a lovely selection that really appealed. I find you need to look very closely at Hermes scarves to pick out colours and it makes them far more interesting than just put with a black or other neutral outfit. One of mine is an Etriers in an orange-y colourway, but on close inspection, I found not only the usual yellow-gold and creamy white but also greys, taupes and brown, which enabled me to find other combinations. I have a little more trouble with another scarf that really only has red and very bright blue with the yellow-gold and white base, but I'm contemplating some of the brighter blue jeans that are around this year! Still, it's all about the challenge, right?! I so love the title of the series.What to wear with a scarf not the other way round.